As the price of oil continues to yo-yo ever higher because of diminishing supplies and political turmoil in oil-producing regions, more and more attention is being paid to coming up with ways to create oil from non-fossil fuel sources, specifically, plants. One of the most promising technologies now emerging uses algae that feed on plant wastes and produce, well, oil, that can be refined and used for tasks like fueling trucks, trains, and aircraft. "Growing' oil in bioresearch labs may seem far-fetched, the stuff of forward-looking science fiction, but in fact, it's happening now. On November of 2011, Continental Airlines Flight 1401, a Boeing 737-800, flew from Houston to Chicago's O'Hare International Airport in a history-making journey that was the first U.S. commercial flight powered by biofuel. That same week, Alaska Airlines made plans, along with its sister airline Horizon Air, to begin a total of 75 flights that would employ a biofuel blend that mixes conventional petroleum-based Jet-A fuel with 20% recycled cooking oil, a mixture that costs less than regular jet fuel and will reduce carbon dioxide emissions by up to10%. Alaska Airlines made the choice to recycle old cooking oil so that it would not interfere with food production. 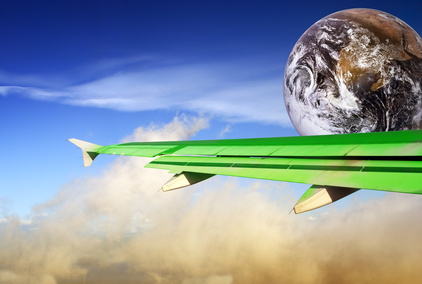 United Airlines recently signed a letter of intent with biofuel producer Solazyme, Inc. to purchase 20 million gallons of algae-derived biofuel every year, beginning in early 2014. As the price of crude hovers around $100 a barrel and keeps going up based on demand, the pressures of commodities speculators, and chaotic political conditions in the Middle East and Africa, more and more airlines are looking at biofuels as a way to manage their fuel costs, and reduce the amount of greenhouse gasses their planes disseminate into the upper atmosphere. Critics of biofuels have made the case that too much corn is being used to create ethanol, which is driving up corn prices worldwide, putting some food out of reach of the poor. Because of this, many producers of biofuels are turning to plants like algae, jatropha, salicornia, which are not used for food, and even making fuel from tallow left over from slaughterhouses. Because biodiesel and other fuels can be made from used cooking oils like soy, canola, and others, biofuels can also play a part in reducing waste, recycling the used oil, and otherwise reducing the waste stream of the world's economies. Beginning in late 2011, KLM Royal Dutch Airlines was the first airline to make a commercial flight using a biofuel mixture, and other European air carriers have followed suite. One of the attractions of using biofuel blends is that they don't require any special modifications to jet engines. Airlines simply substitute certain percentages of biofuels in place of the standard Jet-A fuel. Using these green fuels has the happy effect of being virtually unnoticeable to aircrews. There is no impact on aircraft performance or handling. The Continental 737 flight mentioned earlier used a blend of 60% regular jet fuel combined with 40% jet fuel derived from algal oil. In a blog posted on 11/20/11, Agriculture Secretary touted the idea of biofuels, noting: "Passenger and cargo airlines in America spend about $50 billion on fuel each year. If just a fraction of those billions are used to purchase American-produced aviation biofuels, we'll create thousands of good-paying jobs, particularly in our rural communities. That's why, earlier this month, USDA announced support for a facility that will begin the process of turning algae into jet fuel and create 60 jobs. What's more, USDA has made important investments on aviation biofuels research and development to help universities and private firms expand and improve production. And we are partnered with the Department of Energy and the U.S. Navy to work towards using biofuels in our military planes and strengthen our national security." Vilsack's comments underscore the importance of biofuels both to the airline industry, and to the U.S. Economy in general. Fuel prices are the single biggest expense in running an airline, with oil supplies seemingly always at the mercy of world events. So, it only makes sense to have access to an economical, less-polluting, domestic energy source like biofuels derived from non-food plants and waste products. If the U.S. can become the leader in producing biofuels, it will not only help us along the path to energy independence, it will save money, reduce air pollution from airline traffic (which now generates around 2% of all the greenhouse gases the U.S. produces, and is going up), and keep oil money out of the hands of often hostile and unstable foreign governments. Spending money now to develop more and better sources of biofuels is a win-win choice for the U.S. economy.